Today I am announcing the October Virtual Book Club for kids author. This month, the book club will be featuring the works of author Nick Sharratt. 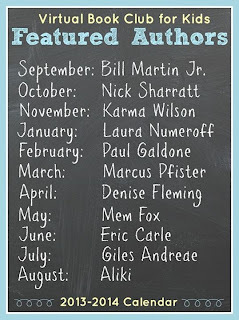 Each month I team up with a group of bloggers to feature one author. At the beginning of each month, I'll remind you of that month's author. Near the middle of the month, there will be a linky party to share the ideas for studying the selected author's books. Several bloggers will write posts featuring ideas. You can write a post or share an idea with the virtual book club each month as well. The linky party will give you a great resource to come back to when you are trying to create author studies or find great book activities for your child. I have a confession about the October author. I've never read one single book written by Mr. Sharratt. It seems a little weird that I've missed him until now. Browsing through his titles, I'm seeing topics like dinosaurs, sharks, pirates, gross food, and robots. How can I have two little boys and miss any books on these topics? We will probably explore several books by Nick Sharratt and we'll be back on October 14th to share our favorite title! Here's a link to several Nick Sharratt books on Amazon. 1. Pick your favorite book by Nick Sharratt and read it with your child or class. 3. Come back and share it with us as part of a big blog hop on Monday, October 14th. The linky will be live for 3 weeks, so if you aren't ready to post on the exact date, just join in when you can! If you don't blog, you can share what you did on our Facebook wall, email us, or just comment on the post. 4. All Blog Participants will have a chance to be featured on our Pinterest Board and Facebook Page! Let us know you're joining us by leaving a comment below in the comment section! Do you like to plan ahead? Here are the authors for the rest of the school year for the Virtual Book Club for kids.